Multi-Master replication stands for the ability to write to any node in the cluster, and not to worry that eventually it will get out-of-sync situation, as it regularly happens with regular MySQL replication if you imprudently write to the wrong server. This is a long-waited feature and there has been growing demand for it for the last two years, or even more. Please note that applying the transaction on remote nodes does not affect the response time of COMMIT, as it happens in the background after the response on certification. First: we can have several appliers working in parallel. This gives us a true parallel replication. Slave can have many parallel threads, and this can be tuned by variable wsrep_slave_threads. Second: There might be a small period of time when the slave is out-of-sync from master. This happens because the master may apply event faster than a slave. And if you do read from the slave, you may read the data that has not changed yet. You can see that from the diagram. However, this behavior can be changed by using variable wsrep_causal_reads=ON. In this case, the read on the slave will wait until event is applied (this however will increase the response time of the read). This gap between the slave and the master is the reason why this replication is called “virtually synchronous replication”, and not real “synchronous replication”. The described behavior of COMMIT also has the second serious implication. If you run write transactions to two different nodes, the cluster will use an optimistic locking model. That means a transaction will not check on possible locking conflicts during the individual queries, but rather on the COMMIT stage, and you may get ERROR response on COMMIT. This is mentioned because it is one of the incompatibilities with regular InnoDB that you might experience. 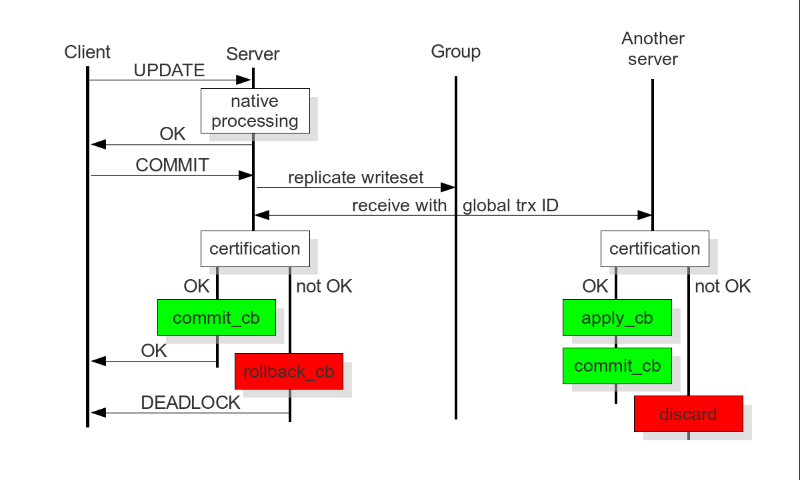 In InnoDB usually DEADLOCK and LOCK TIMEOUT errors happen in response on particular query, but not on COMMIT. It’s good practice to check the error codes after COMMIT query, but there are still many applications that do not do that. If you plan to use Multi-Master capabilities of XtraDB Cluster and run write transactions on several nodes, you may need to make sure you handle response on COMMIT query.